Whether you are interested maintaining your youthful skin, repairing from past sun damage or protecting your face lift investment we have a line of skin care products for you! Not sure which products would be best for you? Cindy Battey, R.N., our skin care specialist can evaluate your skin and suggest a treatment plan. 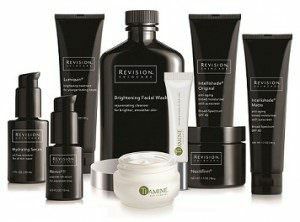 The Revision Skincare Line is an exhilarating and refreshing option available only at your skin care professionals office. Check out an app that allows patients to track the progress of the wound area through the healing process, either by watching this video or reading more. Over the years, Obagi Medical Products has developed prescription-strength skin health systems focused on preventing and/or improving skin conditions including photodamage, hyperpigmentation (chloasma, melasma, and freckles), acne, vulgaris and rosacea. The Obagi Nu-Derm System consists of topical products, which when used as a system, result in substantial improvement to these skin related conditions. The Obagi Nu-Derm System is the number one brand of physician dispensed products in the United States. In April 2004, the Company continued its legacy as a leader in skin health systems, by launching a successful new system of products, the Obagi-C Rx System. As the first and only prescription strength Vitamin C and hydroquinone System, it has been a huge success with both patients and physicians.